What Brexit outcome do you most support? 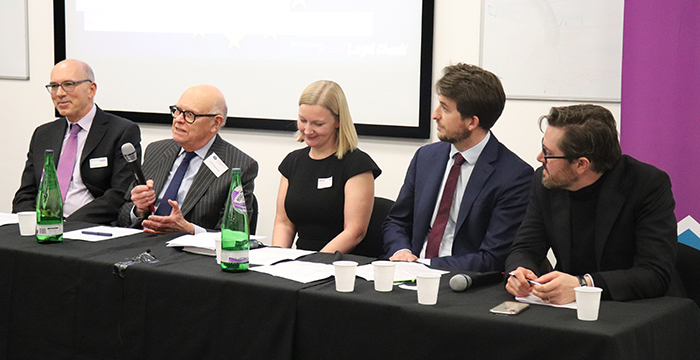 This question was put to 80 attendees in a poll at last week’s student event, ‘How will Brexit disarray affect future lawyers?’, at The University of Law (ULaw) Moorgate. So, what were the results? While 52% of attendees were in favour of a second referendum, more commonly known as a ‘People’s Vote’, 25% supported a Norway-style deal, allowing continued access to the single market. Following closely behind, with 18% of the vote, was Theresa May’s withdrawal agreement — the final version of which has yet to be agreed. Bringing up the rear, and securing a mere 5%, was a ‘no deal’ scenario. But what outcome did the panel of Brexit experts think will happen? First to offer insight was Henderson Chambers barrister Sir Alan Dashwood QC. Sir Alan explained that a ‘People’s Vote’ would be his preferred outcome but noted the difficulties in deciding a question to put to the electorate in a second referendum. The three alternatives would be: the Prime Minister’s deal, no deal and to remain in the European Union (EU). According to Sir Alan, a more “politically saleable” outcome is the Norway-plus deal, which would see the UK join Norway inside the EU’s single market. In addition, to avoid a hard border on the island of Ireland, the UK would have to be part of a customs union with the EU, he explained. Although confident that a parliamentary majority would stop a no deal scenario, Sir Alan did express some concern. In the event of no deal, he warned that lawyers possessing UK qualifications alone would lose their access to the EU legal market. This could see Sir Alan himself, who has appeared regularly before the EU courts for some 30 years, lose both his rights of audience and lawyer-client privileges. Next up was Andrew Eaton, an associate at Hogan Lovells specialising in public law and policy, who recently released a lawyer’s guide to a no deal Brexit. Eaton was quick to remind the audience that a second referendum is not actually a Brexit outcome, but rather a means to an outcome. This option postpones the difficult decision of whether to leave or remain in the EU. Now a key player in Hogan Lovells’ Brexit team, Eaton went on to suggest that the current political deadlock was making a hard Brexit more likely by the day. ULaw associate professor Trevor Tayleur admitted that he had felt optimistic about a second referendum, with a view to remaining in the EU. This, Tayleur explained, stemmed from mounting backbencher support across political parties for a ‘People’s Vote’. However, with the Labour leader, Jeremey Corbyn, dismissing calls to support this option, Tayleur conceded that achieving majority support in parliament was unlikely. In light of this, Tayleur, who played a key role in creating ULaw’s EU syllabus during the mid 90s, predicted Brexit will be a “toss up” between May’s deal and no deal. Looking ahead Ashurst counsel Lorraine Johnston predicted that the Brexit back and forth will continue until parliament finally passes May’s deal, with hours to spare before the Brexit deadline. Weighing up “no deal or her [May’s] deal”, Webber anticipates the latter succeeding but remains positive either way. From the perspective of a US law firm, membership of the EU is unlikely to change London’s standing in the legal world. Rather, London’s ‘cluster effect’, which sees expertise from law, financial services and insurance all come together, ensures the City enjoys a comparative advantage in the global market.